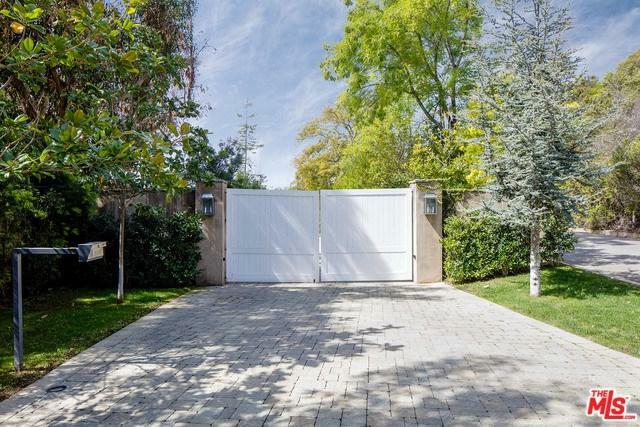 AN INCREDIBLE VALUE...situated behind gates at the end of a long private gated driveway. Absolute perfection completely remodeled Hamptons estate with over an acre of park-like grounds with motor court, rolling lawns and a stunning infinity pool, all overlooking incredible city and canyon views. Featuring 5 bedroom, 5.5 bathrooms, an incredible master suite with soaring ceilings and a sumptuous spa-like bath and dual closets, plus 3 en suite bedrooms upstairs and staff/guest room downstairs. Gorgeous living room with fireplace, paneled library, a state-of-the-art professional screening room, gym, family room, a gourmet chef's kitchen with center island and commercial appliances. Gleaming hardwood floors throughout. Sold by Galina Blackman of Coldwell Banker Residential Br. Listing provided courtesy of Kurt Rappaport of Westside Estate Agency Inc. and Kevin D. Booker of Westside Estate Agency Inc.